Police patrol in Place de la Republique after a series of deadly attacks the previous day in Paris, Nov. 14, 2015. French President Francois Hollande declares three days of national mourning following multiple simultaneous attacks that killed at least 127 people in six locations across capital city. The Islamic State militant group has claimed responsibility for deadly, coordinated attacks late Friday in Paris, where security has been stepped up to guard against further violence. The terrorist group Saturday declared the six simultaneous attacks that killed at least 127 people in Paris were a response to airstrikes against IS fighters in Iraq and Syria. The message said France and its supporters "will remain at the top of the list of targets of the Islamic State." The claim of responsibility appeared in Arabic and French in a statement circulated online by IS supporters. It was not immediately possible to confirm authenticity of the statement, which bore the IS logo and resembled previous statements by the extremist group, but terrorism experts did not dispute its validity. "The stench of death will not leave their noses," IS said of France's leaders, "as long as they remain at the forefront of the Crusaders' campaign, dare to curse our prophet, boast of a war with Islam in France, and strike Muslims in the lands of the caliphate with warplanes that were of no use to them in the streets and rotten alleys of Paris." French President Francois Hollande on Saturday declared three days of national mourning following the attacks across the capital city. The French leader blamed the Islamic State group for the night of horror and called the attacks "an act of war." Vowing to hunt down the attackers, Hollande said, "France will triumph over this barbarity." He called an emergency Cabinet meeting and mobilized France's security forces at the "highest levels." People across France woke up Saturday to a nationwide state of emergency. Eight terrorists were killed, but it was not clear whether there might be more insurgents or accomplices lurking in Paris neighborhoods. Hollande asked Paris residents to stay inside Saturday. Those who venture out are finding many stores closed and a ramped-up security presence, with 1,500 soldiers deployed to the French capital’s streets. Hollande has called off his trip to Turkey for a G-20 meeting scheduled to begin Sunday. The president ordered France's borders closed – an unprecedented act in 21st-century Europe. However, the main airport remains open and trains are still running. On Friday night, as many as 100 people died at the Bataclan concert hall when at least three gunmen opened fire with automatic weapons before taking scores of people hostage. Police later stormed the building, killing at least one attacker. Others may have died in suicide bombings. 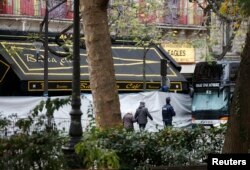 People walk past the screened-off facade of the Bataclan Cafe and its adjoining concert hall the day after a series of deadly attacks in Paris, Nov. 14, 2015. At least 1,000 people were in the Bataclan audience, where a performance by an American band, the Eagles of Death Metal, was interrupted by rapid gunfire. Many people escaped during the shootout. Fatalities were also reported in other parts of Paris. One of the first explosions was just outside a sports stadium where Hollande and a large crowd were watching a football (soccer) match between the French and German national teams. The blast was felt inside the stadium. Police evacuated Hollande from the stadium, but when play was stopped many people in the crowd ran onto the field and huddled in fear. Several other explosions took place in that area and officials say at least one may have been a suicide bombing. Elsewhere in the French capital, several people were killed at a Cambodian restaurant. Attacks also reported at cafes. Authorities say about 200 people were wounded Friday, 80 of them seriously. On Saturday, Paris Mayor Anne Hidalgo extended sympathies to victims, their families and friends, saying "pain is something we share." But she vowed that the city and its people would "be stronger than those who want to reduce us to silence." In Washington, President Barack Obama said the United States was ready to help in any way possible. He called the coordinated attacks in Paris an "outrageous attempt to terrorize civilians." Obama was meeting with the National Security Council to review the latest intelligence data on the Paris attacks before leaving for the G-20 meeting, scheduled for about 2:20 p.m. EST (1920 GMT). Before departing Vienna for Antalya, Secretary of State John Kerry will participate in the NSC meeting via video teleconference. Vice President Joe Biden said "such savagery can never threaten who we are." Kerry described the attacks as "heinous, evil" and "vile." Defense Secretary Ash Carter said "the horrific and barbaric attacks in Paris were more than an attack on the nation or people of France – they were an assault on our common human dignity." Earlier Friday, the Pentagon said it was "reasonably certain" a drone strike had killed Mohammed Emwazi, the Islamic State militant popularly known as "Jihadi John" from videos in which he’s shown executing people, including three Americans. The Kuwait-born British man had lived in west London for years before traveling to Syria to join IS. U.S. officials said the embassy in France has been checking on the safety of all Americans in Paris. The U.S. Department of Homeland Security said in Washington that there was "no specific or credible threat to the United States." But security has been stepped up in some major U.S. cities as a precaution. Journalists work outside a restaurant where bullet impacts are seen the day after a series of deadly attacks in Paris, France, Nov. 14, 2015. In a letter to Hollande, European Council President Donald Tusk said "We will ensure that the tragic, shameful act of terrorism against Paris fails in its purpose: to divide, to frighten, and to undermine liberty, equality and fraternity, the values that make France a great nation." Britain's Prime Minister David Cameron, in remarks Saturday, said, "It is clear that the threat from ISIL is evolving" and that, despite high security, he and his countrymen "must be prepared for a number of British casualties." "The terrorist aim here is to divide us and destroy our way of life," Cameron said, urging solidarity. He promised help to France, saying, "Your pain is our pain, your fight is our fight." At the United Nations, a spokesman said Secretary-General Ban Ki-moon "condemns the despicable terrorist attacks" and "demands the immediate release of the numerous individuals reportedly being held hostage in the Bataclan theater." A statement from the Vatican said Pope Francis was following the "terrible news" out of Paris. "We are shocked by this new manifestation of maddening terrorist violence and hatred which we condemn in the most radical way together with the Pope and all those who love peace," the Vatican statement said. 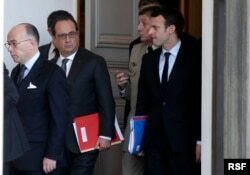 From left, French Interior Minister Bernard Cazeneuve and President Francois Hollande and other officials walk out of the Elysee Palace after a Defense council meeting following attacks Friday in Paris, France, Nov. 14, 2015. 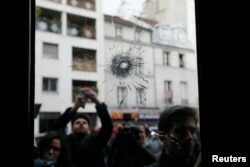 Brian Katulis, a senior fellow at the Center for American Progress, told VOA the Paris attacks "all look like they were coordinated to have maximum impact, and to send a message." "It demonstrates that there are a lot of vulnerabilities in open societies that can be exploited by whatever terrorist groups are carrying out these actions," Katulis said. Friday's assault evoked memories of an attack by Islamist gunmen in January that killed 17 people. Paris is due to host a major U.N.-sponsored conference beginning November 30 on the international effort to control global warming. VOA White House Correspondent Aru Pande, National Security Correspondent Jeff Seldin, Luis Ramirez, Lisa Bryant from Paris, and Jamie Dettmer contributed to this report. French President Francois Hollande said more than 120 people died Friday night in shootings at Paris cafes, suicide bombings near France's national stadium and a hostage-taking slaughter inside a concert hall.